As a quick early filler, we played a swift 2-player of this delightful little card game. Much fun, especially as I beat Becky. I was to look back on this as a 'golden age of winning' later in the day. Biblios soon drew the attention of Alex and Kez (I assume I've spelled that right. How else would you spell it? ), and they joined us for a 4-player. In terms of scoring, probably the tensest game of the day: Alex winning 4-4-4-3 on a money tie-break. All four of us declared a love for this dippy dice-placement-fest, and we broke out Alex's copy, complete with plastic bowls (why don't I ever think of useful stuff like this?). It was a game woefully low on influence, but both Alex and I abused the sculptor frequently and heavily. His abuses being of the greater magnitude, he won. And, in fact, I found myself back down in third after Kez swept the bonus cards. Steve Kearon (he of many, many games) had expressed a perverse desire to play this. Actually, it's not at all perverse, because it's a real hidden gem for me too. Which completely doesn't excuse my miserable failure to teach the rules properly. Steve, Pete and Malcolm were happy enough to go along with a mid-game 'switch' to the proper rules, and although I thought they were nodding off at one point, it proved to be a proper thinky finish. Malcolm won by creatively blocking off Steve's bonus card at the last. I think everyone enjoyed it once we got the rules right; or, if not, they were at least polite. Pete remained, Becky joined us, and Malcolm watched and asked questions as we plunged into a 4-player dice-fest. Becky quickly latched onto the similarities with Fiji - one of her favourites - and promptly thrashed us. Ah...my guilty pleasure of Cardiff days. Becky had insisted on being shown the proper way to play this. And no-one plays it with more gusto than Matt (or Vizier-nee-Sultan Matt as he became after a visit to Stonehenge). Becky, despite at one point labouring under two princesses and an annoying butcher, struggled back to Baghdad for the win. Meanwhile, Fe wandered around in a grief-stricken mess (not really helped when she appropriated the barber as well), and I got married and scorned simultaneously and kept having to return home to tell my wife what I was doing. 'Fantasy' game, you say? 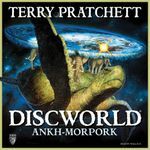 Matt and Jon surprised me by having no prior experience with this game, but clearly knowing the oeuvre well, they were ripe for a couple of rounds of Ankh-Morpork. Becky won the first game a little easily as Chrysoprase, and Matt probably SHOULD have won the second were it not for a premature claim which tipped us off to his secret character. My Vimes-victory felt a little tainted after that. With several tables fortuitously all breaking up at once, we employed the time-honoured tactic of 'get something out that looks interesting and wait for people to join in'. Joe and Jerome both found their attentions attracted, and it wasn't too difficult to persuade Steve to join in as well. And a terrific high-scoring game it was, with several complementary strategies going on. Joe went in heavily for green men, tying with Jerome's skill base on 52. I built the 'no-one wants to visit us' village and an astonishingly efficient wood-storage engine which garnered me 61 points without bothering the Winter tiles too much. Up at the grown-up end of the leaderboard, Becky collected hundreds of yellow men and metalworking tiles to edge out Steve's bits-and-pieces approach. It was getting toward silly stage of the day, so I managed to talk a brave sixsome (including Jake, who looked as if he might regret it after being handed the start player) into this dice throwing/rolling/bouncing off your nose silliness. 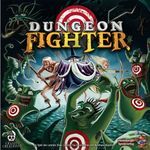 Despite having a maximum size party, and David as Sir Moo healing us left, right and centre, we succumbed heavily to an allegedly 'Level 1' Shady Guy (throw over your shoulder), and battled on futilely to the end of the Stage 2 dungeon, where a Troll beat the living crap out of us. We terminated with that most ridiculous of card games, Jerome proving that the English are no match for suave Europeans when it comes to making up absurd facts and calling each other liars. Having arrived earlier than anticipated (given it was a long trip, I allowed for hold ups which naturally never materialised!) we arrived while Pete and Louise were setting up. After having helped with the tables and chairs, Pete joined us for a quick game of Kingdom Builder, which he won, beating Kez by three and myself by ten. Following the games of Biblios and Troyes, Kez and I played Spyrium with Becky while Ben & co. played Skyline. 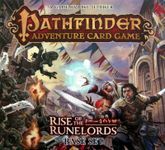 It was the first time we'd played it with more than two players and expected the dynamic to shift - which it did slightly, but not as much as we might have expected. Kez and I had played it about three times before, so gave us an unfair advantage as we taught it to Becky. A quick two person game between Kez and I to fill a few minutes until games already in progress ended and the groups rearranged. I was rather surprised to find I'd beaten Kez by twenty points - normally it's the other way around. Steve seemed to be powering ahead, Jake and Kez in the middle ground with myself trailing from almost the start having invested in some long-term payoffs but crippling my short term outlook. But then Jake declared he'd achieved the game-end conditions and called the final scoring phase. Had Steve scored again the outcome may have been very different, but it was timed perfectly and Jake won handsomely. My own score was embarrassing. Dave joined the four of us following the Carrara debacle for the five player game of Spyrium. The extra players not only mean more competition for the available buildings and resources, but the amount of money can be very different. While more money is - potentially - available, there can be bigger drains on your funds too. Dave won convincingly with 76 points, beating Kez and my 69 and 68, with Jake and Steve tied only just behind at 66, all having put in excellent shows. I opted to forgo buying a technology (and thus doing without the end-of-game bonus it gives in addition to the ability it grants) in favour of a very powerful mining/refining combination which, in hindsight was a mistake. While Dave's industrial powerhouse was less mighty, his Capitalization technology gave him plenty of extra money during the game and bonus points for surplus cash at game end. 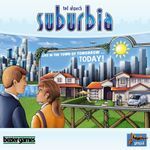 And finally, before heading off shortly after eight, we finished with a game of Suburbia between Kez, Dave, Jake and myself. First time playing for Jake and Dave, and who seemed to thoroughly enjoy it. Kez trounced us all solidly. Especially me, in last place having had two of my intended goals inadvertently frustrated by other players in the final turns. Thanks all, for a very fun day. I might as well add my games played to the list. I always like to try to get soemthing painted up for these games days, partly so there's a bit of 'game eye candy' on show and partly just to show off. 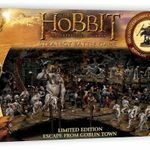 My choice this time was Escape from Goblin Town! As for the game? ..... Lovely miniatures! Next we broke out a 6 player version of this. I hadn't had a chance to read through the rules or even unwrap the cards yet. Damo had read through the rules a couple of times but was still a little unsure of it so this was very much a 'learn as you play' type of affiar. In my experience this is normally a recipe for disaster but in this case it actually went quite smoothly. I really like this game! After all day brunch down the local pub, we came back and had a 6 player game of RoboRally. This isn't a game I'd want to play too often but every now and then it's good for a bit of chaotic fun. I think it works particularly well in a 'convention' type atmosphere. I've been wanting to try this for a while so I was really pleased Mark brought it along. It's a real pretty looking game. It's one of these games that uses icons for everything, which I guess makes it languange independent but it always takes me a while to get my head around what all of the symbols mean. As a result of this, it took me a few turns to really figure out what I was doing. The game itself seems pretty good. Fairly brutal (which I tend to think is good for a co-op game) and quite a clever design. All my plays have been covered here, apart from another play of Las Vegas (with Joe & Jerome) and my first game of the day. I wasn't too sure about Ginkgopolis when I first played it last year, but its recently grown on me. I enjoyed my play with Matt & Pete - hopefully they enjoyed it too, although it is one of those games where you're never quite sure how much control you have over your destiny. I finished the day off with a game of Pirate Dice. Not a bad little game. 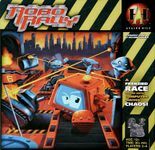 Plays pretty much like Robby Rally only quicker and less chaotic. Would have probably had more fun with this if I hadn't already played RoboRally earlier on! I'm always suprised how quickly these games days go. I was there for nigh on 11 hours and only managed to get 5 games in!